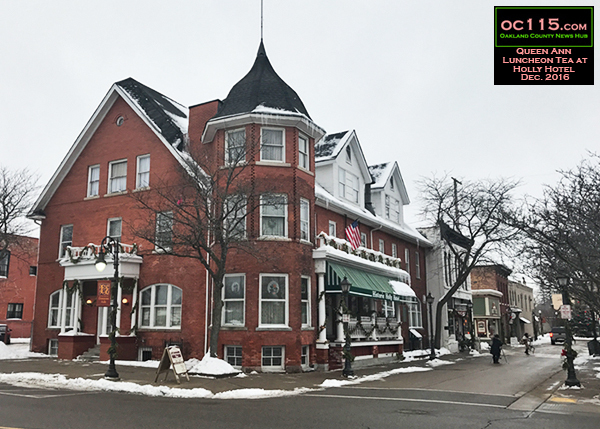 Holly, MI – The Queen Anne Tea at the Holly Hotel was both beautiful and remarkably affordable, especially given the quality of the food. 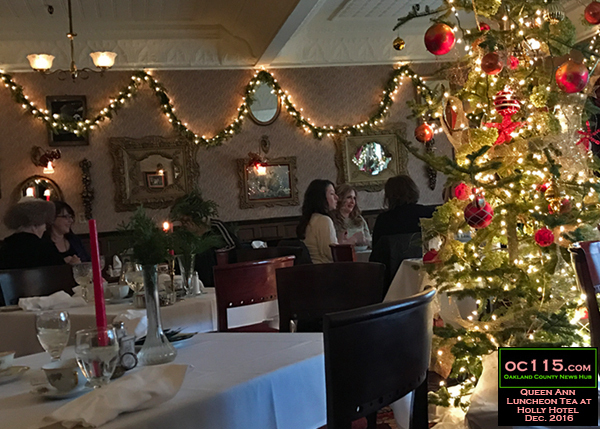 The fresh baked pastries, the menu options prepared with professionalism and care, and the enthusiasm of the staff show why this family-run business attracts visitors from near and far for this fancy dining experience. 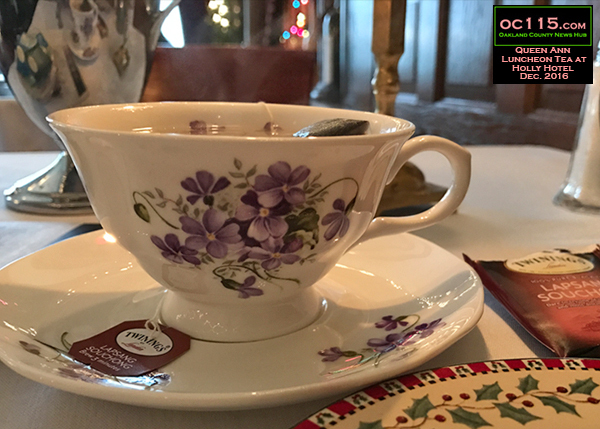 As in Victorian times, guests are given a plate with a selection of teas, a pot of hot water and a quaint tea cup. I decided to try the “Lapsang Souchong” tea since I’d never had it before. 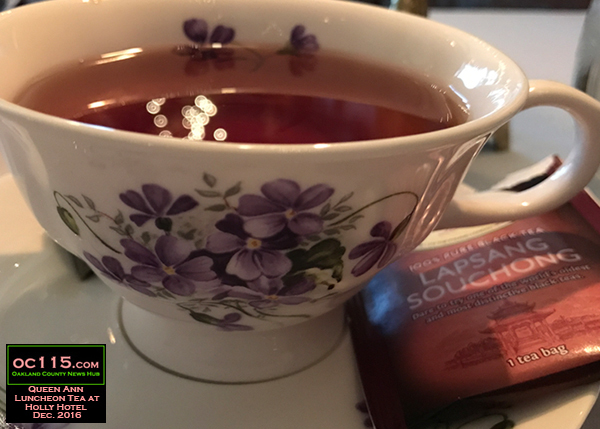 The waiter said that that Lapsang Souchong is the tea world’s equivalent to a good strong whiskey. Which seemed like a good comparison. That tea had a thick smoky smell and taste and was strong and unique. It’s the only tea where I have noticed that each sip takes my mouth through a series of flavors and after tastes. 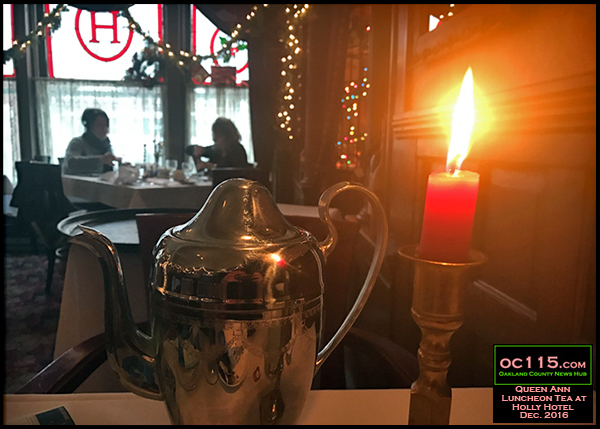 I also had a cup of Lady Gray Tea, which was much lighter than the Lapsang Souchong. It was refreshing and lemony. 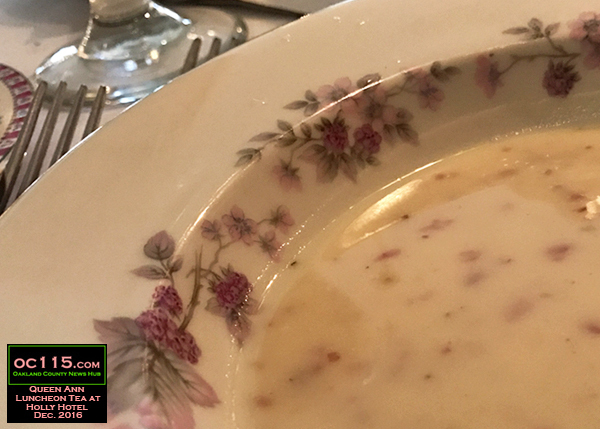 The first course was potato leek soup with bacon. 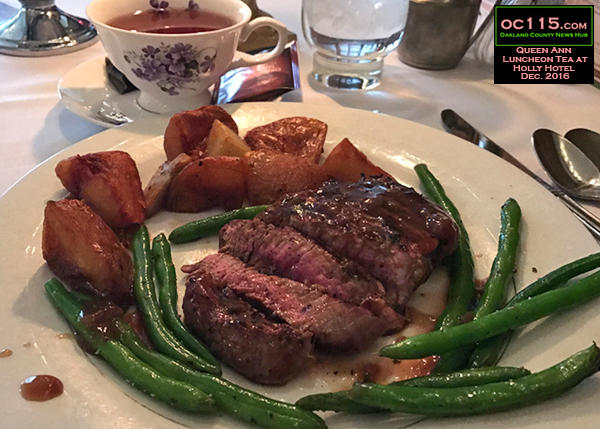 And then there was a petite Filet Mignon served with roasted potatoes and crispy green beans. The steak was cooked perfectly and tasted fantastic. There were several choices for this course, including a chicken pastry, a fish dish or a vegetarian dish. 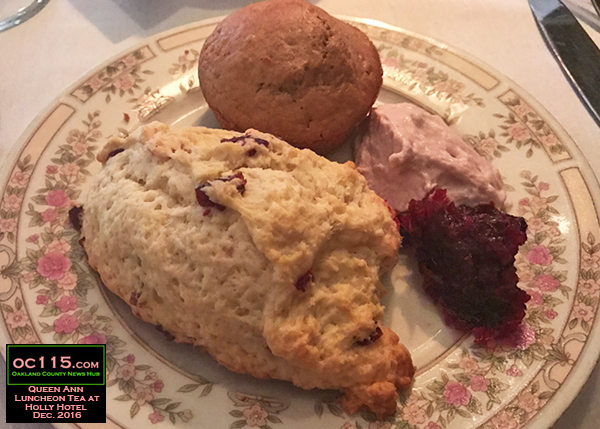 That was followed up a plate of goodies for desert: a house made cinnamon muffin, a cranberry scone, a creamy mouse and a cranberry compote. During the luxurious meal I also tried a special holiday drink. 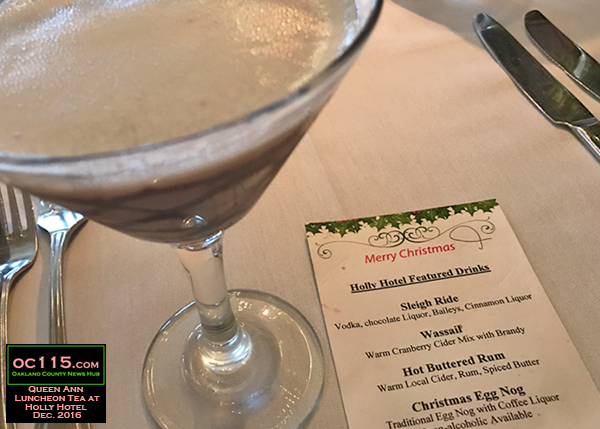 The “Sleigh Ride” was made of vodka, chocolate liquor, Bailey’s, and cinnamon liquor. The food, the drinks and the service were the highest quality. And the atmosphere matched that. 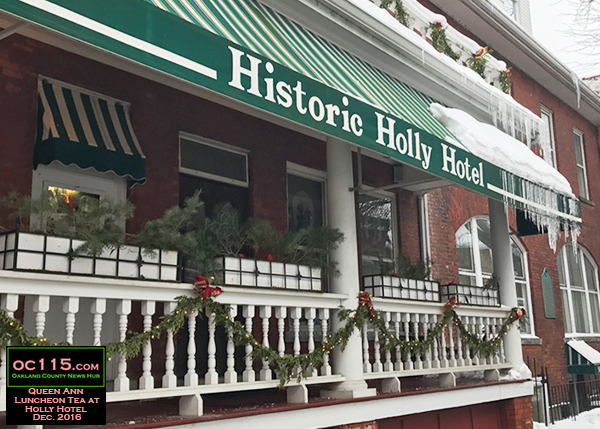 The Holly Hotel first opened in the late 1800s. It has burned a few times and been restored. It’s no longer used as a hotel, but as a place for dining and special events. 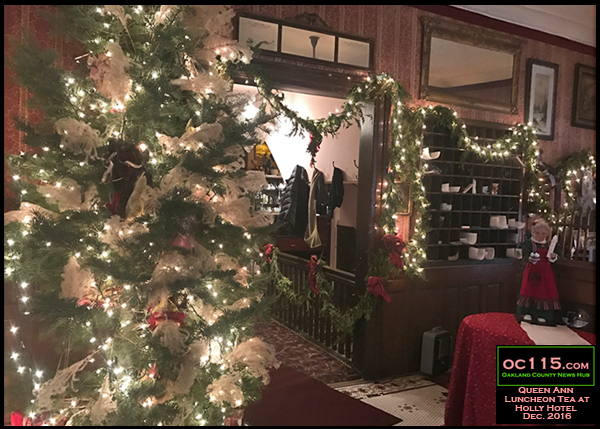 The ornate plaster walls of the dining room are decorated with gold-framed paintings and for the holidays there is garland along the walls and a Christmas tree covered in lights and ornaments in the center of the room. 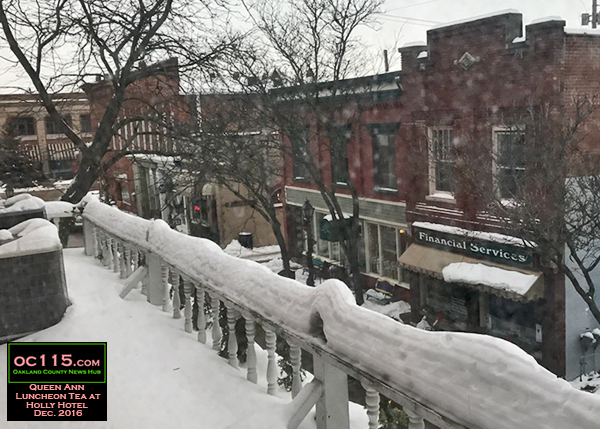 The building fits well with the historic setting of Downtown Holly. The community is known for their stores full of antiques, gifts and decor. 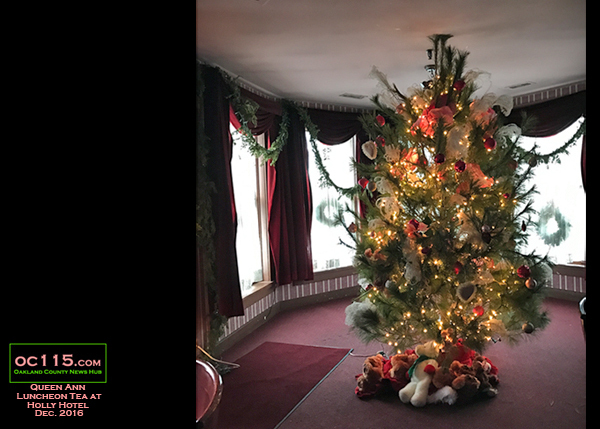 Nearby is The Vintage Farm House, Shops at 101, Arcade Antiques, Holly Antiques and N. Reding & Sons. To learn more about tea at the Holly Hotel, visit their website at hollyhotel.com. For other stories about visiting historic Downtown Holly, check out our special section: Daytrip to Holly.